Dual flash is one of the flash types designed for macro photography. 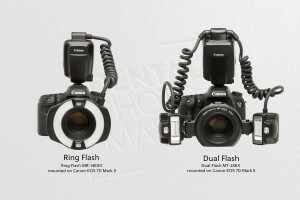 The main difference between a ring flash and a twin flash is the flexibility in flash heads positioning. 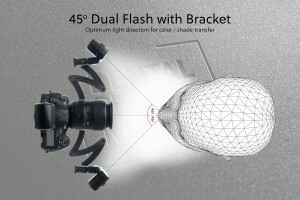 The ring flash has flash tubes permanently built-in into a ring, which is attached to the lens. Dual flashes are constructed differently: they have two flash heads, which are mounted on a separate ring, or on a bracket. – A flexibility of positioning of the flash heads. You can set them close to the lens axis to obtain light direction similar to a ring flash or position them in a distance to gain more information about texture (when in use with a bracket). Dual flash is available with wireless communication or with classic wires. 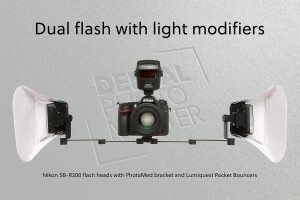 If you have wireless flashes you can control them in two ways. Some of the cameras’ models have a built-in commander. Others will need a separate commander attached to the hot-shoe of your camera body. I prefer to use an external commander instead of a built-in one (even if my camera has it). What would be your suggestion for the magnification to be used when set the bracket at 45• for shade taking? And where do you recommend to position the flash in relation to the lens (in fornt, same level, or rear) to it. And why? 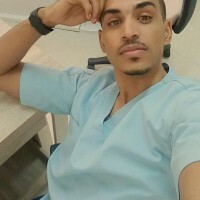 .. or does every position serve a different purpose and there is no ideal postion? High Kris…. can I be sure, that Nissin i40 are working well with commander SU800? 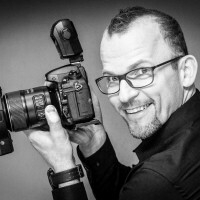 what should i do if i don’t have dual or ring flashes ? is it right if i use the LED lights as a light source ? and where i have but my lights ?